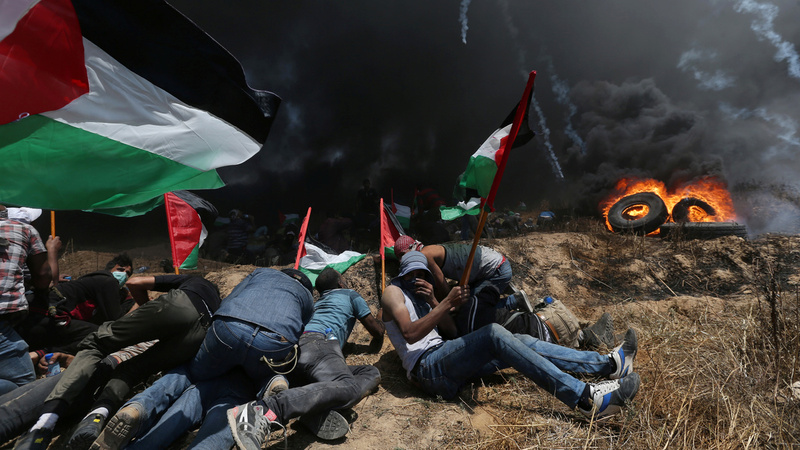 55 Palestinian Protesters Killed, Gaza Officials Say, As U.S. Opens Jerusalem Embassy : The Two-Way Tens of thousands of Palestinians protested the opening of the American embassy, on a day that also marked 70 years since Israel's creation. Palestinians carry the body of Mousab Abu Leila, 29, at his funeral after he was killed along the Gaza border during a protest against the U.S. move of its embassy to Jerusalem. More than 35,000 people are protesting along the Gaza border, the Israel Defense Forces say. The army says it killed three protesters who were trying to set a bomb next to the security fence in Rafah. It's the most deaths in one day the area has seen since the summer of 2014, when more than 2,000 Palestinians died. Palestinian Authority President Mahmoud Abbas called it a "massacre," and asked for a new partner to step forward and replace the U.S. in brokering talks with Israel. 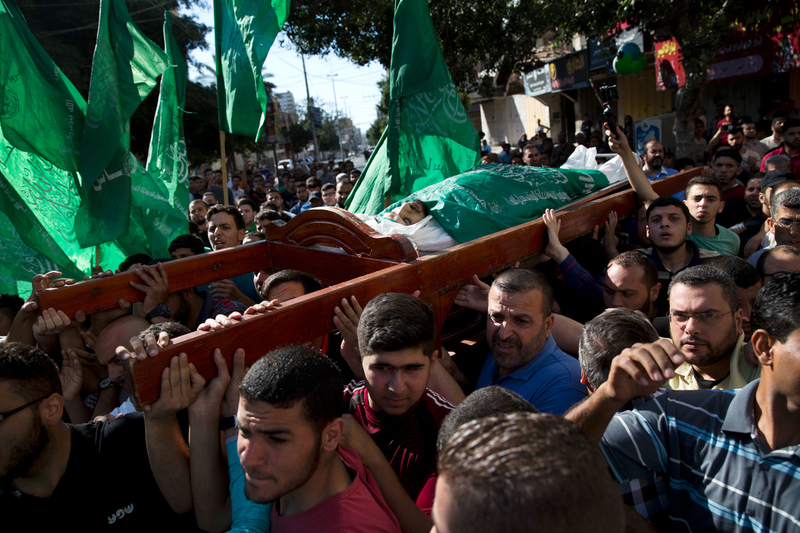 The White House is blaming the deaths on the Palestinian Islamist group Hamas. "The responsibility for these tragic deaths rests squarely with Hamas," principal deputy press secretary Raj Shah said at a White House press conference Monday afternoon. "Hamas is intentionally and cynically provoking this response," Shah said. "As the secretary of state said, Israel has the right to defend itself." The number of casualties rose steadily on Monday, as the opening of the American embassy at 4 p.m. local time (9 a.m. ET) neared. The health ministry published a list of the dead, showing that their ages ranged from 14 to 39 years old. As news of the violence spread, U.N. Secretary-General Antonio Guterres – who is slated to visit President Trump in Washington on Friday – said he is "particularly worried" about what he called "the high number of people killed," according to the AP. The embassy's controversial opening comes as Israel marks its creation 70 years ago – an event that Palestinians refer to as Nakba – Catastrophe – because that development also turned more than 700,000 Palestinians into refugees. "A great day for Israel!" President Trump tweeted on Monday. He also told his followers to watch Fox News for coverage of the embassy's opening. Discussing the dozens of deaths today, Israeli Public Security Minister Gilad Erdan said that the rising number "doesn't indicate anything – just as the number of Nazis who died in the World War doesn't make Nazism something you can explain or understand. There is one truth." Palestinian demonstrators take cover from Israeli fire and tear gas during a protest against the U.S. move of its embassy to Jerusalem, at the Israel-Gaza border in the southern Gaza Strip. That quote comes from Haaretz, which says Erdan also blames Hamas for encouraging a "cynical and malicious use of bloodshed." Both Israelis and Palestinians claim Jerusalem as their capital. Trump announced last December that he would break with the consensus of America's allies and decades of tradition by recognizing Jerusalem as the official capital, and moving the embassy there from Tel Aviv. "The rioters are hurling firebombs & explosive devices, burning tires, throwing rocks, & attempting to ignite fires in Israeli territory," the army said via Twitter. "IDF troops are responding with riot dispersal means and fire, and are operating according to standard operating procedures." Both sides of the conflict had been preparing for today's events. In Hamas-ruled Gaza, violent protests have erupted every Friday since March, venting anger over Israeli's blockade. The Israeli Defense Forces say that terrorists are using civilians to cover their actions; military jets have been dropping leaflets warning Palestinians not to come near the security fence. "We are witnessing an abhorrent violation of international law & human rights in Gaza," Amnesty International said of Monday's violence. Noting that more than 500 people were reportedly wounded by live ammunition, the organization added, "This must end immediately." Facing thousands of casualties, health officials in Gaza issued calls for people to donate blood, and for international agencies to send materials and supplies. A much calmer demonstration took place in the streets outside the new U.S. embassy's location in Jerusalem's Arnona neighborhood. There, protesters marched, chanted slogans, waved Palestinian flags and held up signs, amid a large security presence. The U.S. delegation visiting Israel for the opening includes the president's daughter and son-in-law, Ivanka Trump and Jared Kushner, along with Deputy Secretary of State John J. Sullivan, Treasury Secretary Steven Mnuchin, Special Representative for International Negotiations Jason Greenblatt, and Ambassador David Friedman. On Sunday, that group dined with Prime Minister Benjamin Netanyahu on Monday, the Israeli leader also welcomed Florida Gov. Rick Scott, along with members of Congress, including Sen. Lindsey Graham and Rep. Joe Wilson. As NPR's Camila Domonoske reported when Trump announced the change in December, the president said that "his announcement does not mean the U.S. is taking a position on any possible future peace negotiations between Israelis and Palestinians or on the 'final status' of Jerusalem after such talks." "Today we finally acknowledge the obvious," Trump said. "This is nothing more or less than a recognition of reality." To thank Trump for his decision, Jerusalem's mayor, Nir Barkat, renamed a square near the new U.S. outpost. Secretary Mnuchin received a plaque today bearing its new name: "United States Square in honor of President Donald J. Trump."